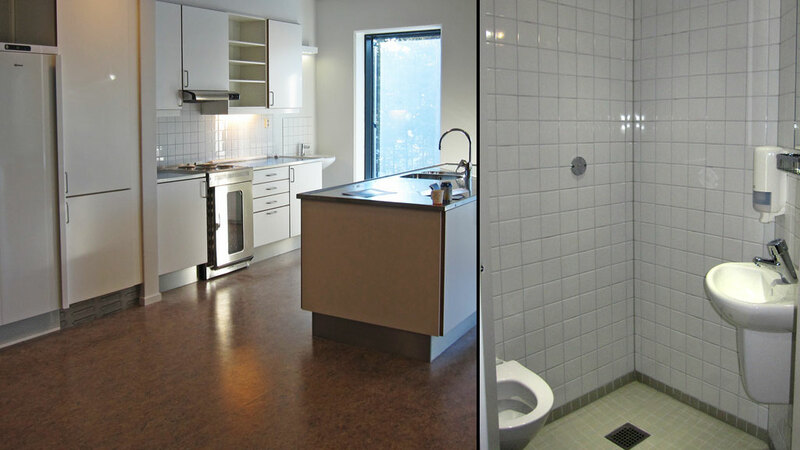 Halden Prison, Norway – Luxury Hotel or Humanity? 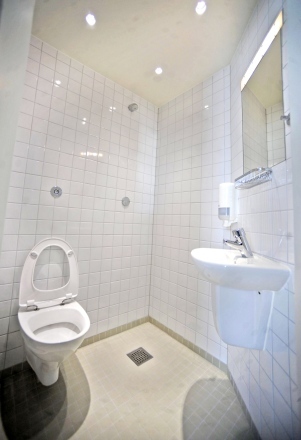 Home › Quirky › Halden Prison, Norway – Luxury Hotel or Humanity? Halden Prison is the newest prison in Halden, Norway. It was designed by Erik Møller Architects and received its first inmates March 1, 2010 but was officially opened on April 8 by the Norwegian King Harald V. The prison has a capacity of 252 prisoners. Art plays an important role at the Halden Prison, and a number of Scandinavian artists have participated in decorating the prison walls. The art is intended to provide new insight so that the inmates get the feeling of being taken seriously. It may also may contribute to increase the inmate’s life quality because it represents something else than punishment, control and security. 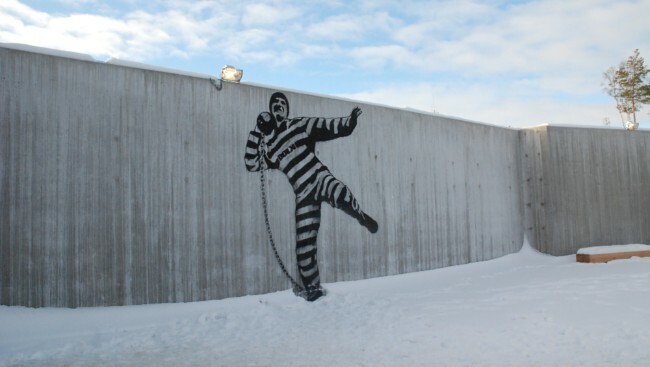 The Norwegian Street-art artist Dolk contributed with his somewhat satirical and humorous stencil motif on one of the prison walls. It shows a prisoner in a striped suit who try to throw his ball and chain over the fence. In an article in Time Magazine, Halden Prison and the prison rehabilitation work were described. A cell includes amenities such as a television, a refrigerator, unbarred vertical windows that let in more light and designer furniture. Prisoners share kitchens and living rooms every 10–12 cells, jogging trails, and a sound studio. There are cooking and music classes offered. Half the guards are women and guards are typically unarmed because guns “create unnecessary intimidation and social distance”. Prisoners receive questionnaires that ask how their prison experience can be improved. Halden, Norway’s second largest prison, with a capacity of 252 inmates, opened on April 8. It embodies the guiding principles of the country’s penal system: that repressive prisons do not work and that treating prisoners humanely boosts their chances of reintegrating into society. “When they arrive, many of them are in bad shape,” Hoidal says, noting that Halden houses drug dealers, murderers and rapists, among others. “We want to build them up, give them confidence through education and work and have them leave as better people.” Countries track recidivism rates differently, but even an imperfect comparison suggests the Norwegian model works. Within two years of their release, 20% of Norway’s prisoners end up back in jail. In the U.K. and the U.S., the figure hovers between 50% and 60%. Of course, a low level of criminality gives Norway a massive advantage. Its prison roll lists a mere 3,300, or 69 per 100,000 people, compared with 2.3 million in the U.S., or 753 per 100,000 — the highest rate in the world. Halden’s greatest asset, though, may be the strong relationship between staff and inmates. Prison guards don’t carry guns — that creates unnecessary intimidation and social distance — and they routinely eat meals and play sports with the inmates. “Many of the prisoners come from bad homes, so we wanted to create a sense of family,” says architect Per Hojgaard Nielsen. Half the guards are women — Hoidal believes this decreases aggression — and prisoners receive questionnaires asking how their experience in prison can be improved. There’s plenty of enthusiasm for transforming lives. “None of us were forced to work here. We chose to,” says Charlott-Renee Sandvik Clasen, a music teacher in the prison and a member of Halden’s security-guard chorus. “Our goal is to give all the prisoners — we call them our pupils — a meaningful life inside these walls.” It’s warmth like that, not the expensive television sets, that will likely have the most lasting impact. So, if someone serves a sentence here, is released and re-offends, do they get to go back here, or are they sent somewhere else? It’s an interesting concept, I hope it’s successful.